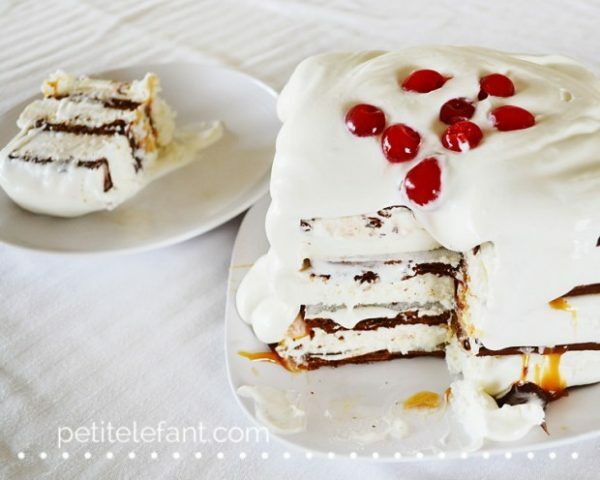 If you need an easy dessert for any sort of gathering this summer, look no further than this simple, extremely tasty ice cream sandwich cake. 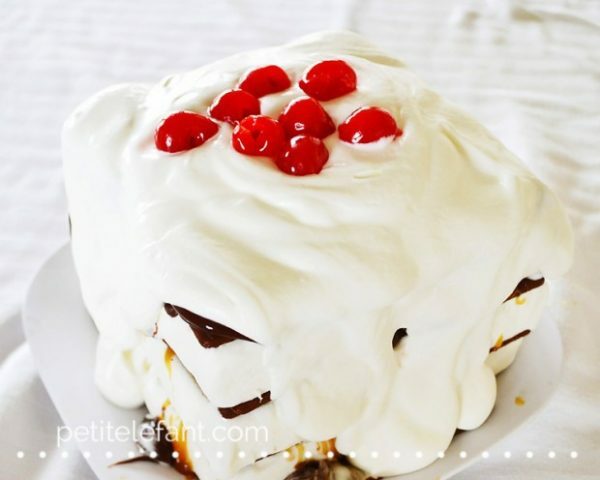 A mountainous slab of ice cream sandwiches covered in soft, snowy white caps of whipped cream. 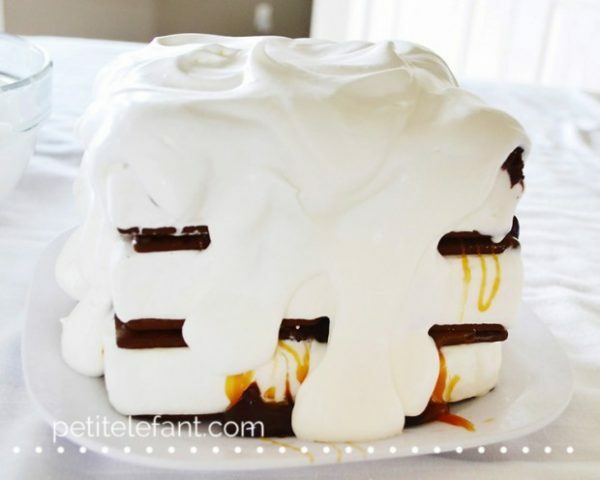 Henceforth known to my family as The Matterhorn Cake. It’s not vegan or paleo or clean or in any way healthy, and requires zero baking, and can be made a day or two in advance. Yes to all of those things, thank you very much. 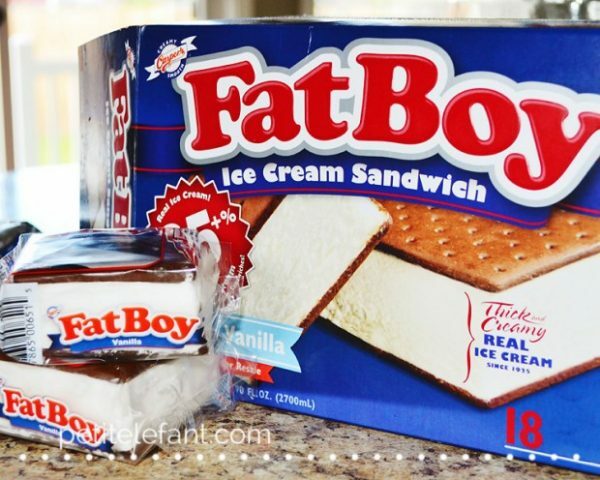 My husband is a Cache Valley, UT native and a Fat Boy Ice Cream sandwich, made in his hometown, is a beloved treat. It’s the only ice cream sandwich worth eating, he maintains. Thus, the foundation for this dessert, a mountain of totally worth-it calories. Awesome, just like the real Matterhorn in Switzerland. Or the one at Disneyland. Whichever. But you can truly use any kind of ice cream sandwich you prefer. 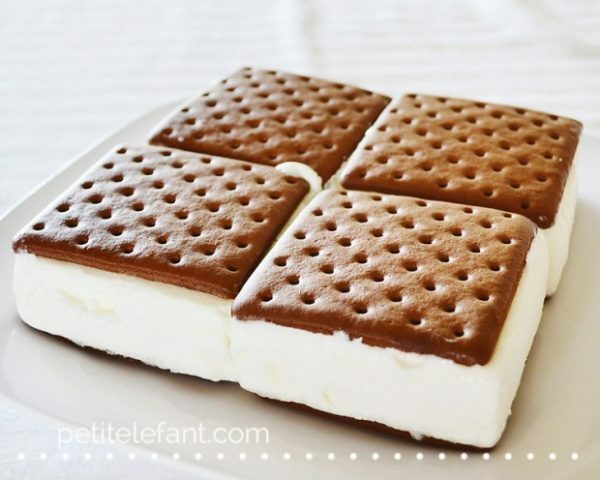 I chose to make a square shaped mountain of ice cream sandwiches but you could easily arrange them lengthwise and use as many layers and rows and ice cream sandwiches as you like. We used 12, for 3 layers. 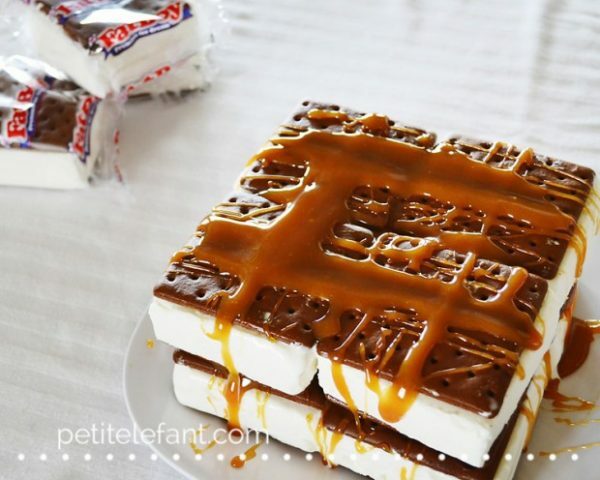 Begin by unwrapping the ice cream sandwiches all at once, for ease and speed of assembling your cake. Then gently and slightly warm your caramel and fudge sauce for easy drizzling. 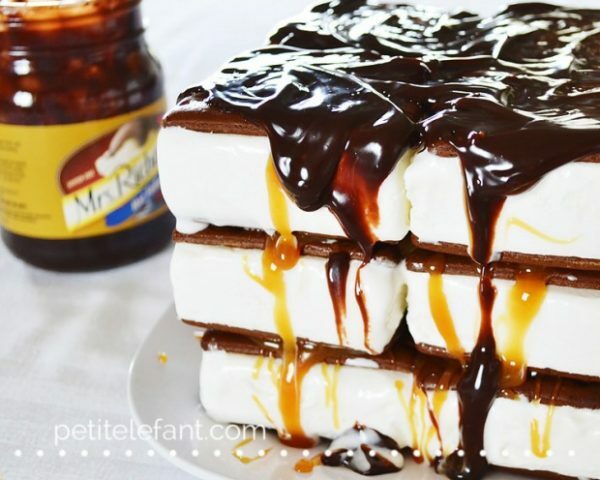 This will help spare too much melting of your ice cream sandwiches. Also, clear a space in your freezer to accommodate your finished dessert. Arrange your first layer of sandwiches on a freezer-safe plate or tray or cake stand. Drizzle a big fat spoonful of your slightly warmed caramel sauce over this first layer, allowing it to settle down in the cracks between each ice cream sandwich and drip over the sides a bit, if you like. I do. 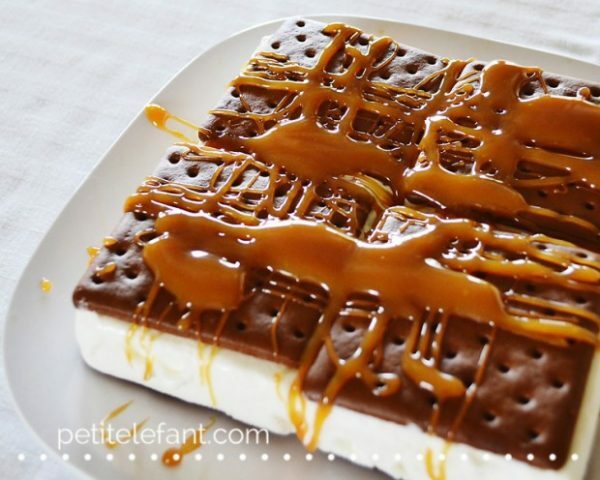 Add your second layer of ice cream sandwiches and repeat the caramel sauce. Repeat again with any remaining layers, ending with a layer of the ice cream sandwiches. Then, generously drizzle that wonderful hot fudge. Let it drip down the sides of in a very tempting manner. Lick the spoon when you are done. Because I did. At this point, I suggest placing your Matterhorn cake in the freezer for a couple of hours. If the ice cream has softened a bit or if your tower looks a little lopsided, just use a couple of spatulas to gently press everything together and straighten it out then put it in the freezer. Perfection not necessary. Resist the urge to make it perfect. Just before you are ready to serve, whip that whipping cream until soft peaks form. You want it to be fluffy and have some structure but also fall over the sides of your layers a bit. Not too stiff. As your spoon it over the tower, or mountain, if you will, of ice cream sandwiches, add some soft whorls and peaks. At this point you can garnish and freeze it again until ready to serve, or garnish and serve immediately. I can truthfully say this rich, decadent treat was unanimously raved about my every member of my household. Bazillions of calories notwithstanding, it was pretty dang tasty if I say so myself. I’ve been thinking that a variation done with sliced bananas or berries between the layers might also be delicious. Perhaps with the sliced berries folded into whipped cream and spread across each layer? Add mint extract to the whipped cream in place of the almond and garnish with a sprig of fresh mint, perhaps. Let me know what you try!